Looking at Obama's Heavenly Day Stem, it shows Yin Earth. 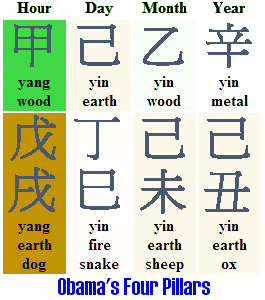 From the 4 Pillars Chart, it can be seen that Barack Obama born on Earth Snake day for the month of wooden Sheep in the Metal Ox year in Summer. Obama day is Ji representing brown earth and a Si snake in the Fire group that has Earth. Both the Sheep and ox are in the Earth Group and the friendly cycle shows Fire is the Supporting element for Earth. With these two combinations, the bonding is stronger than all other elements. This shows that Obama has a very strong personality and good health with the strong Earth support. Based on the chart, Obama's favorable elements will be water, wood and metal. These are the 5 elements that are controlling the life of Barack Obama. 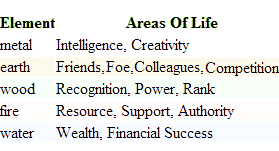 Each element has its own meaning and these are the meanings. Looking at his chart, Barack Obama has more Yin than Yang. This shows that he is likely to be a person that keeps secret and hard for people around him to understand or know what is in his mind at all times. Having Metal makes Barack Obama to become famous and strong career path during the age of 39 to 58. Barack Obama is a person that has alot of hidden potential for power and leadership that can be proven surprising to many who know him. He possesses the ability of making people to think of his way completely with trust. Obama has courage, nobility and energetic to make him a likeable President. It shows that Obama had an unstable and difficult childhood where he was having problems with siblings, friends and relatives. He was brought in an environment of fighting for himself to become what he is now challenging for election to be the next US President. It is shown that Barack Obama is very popular among others and great with his speeches. Based on the 10 year luck pillars, at the age of 9 to 18, the wood element was causing pressure to the Earth element belonging to Barack Obama. From his birth chart, it shows Obama has a very strong personality and great determination in his school days. Unfortunately the day shows that he was not having a good relationship with his father. From age 19 to 28, he got the water element which means Money. The fire element represented to his supporters therefore during that period, it was likely that he was fight for reputation, money and power. Again from the age of 29 to 38, he had water element meaning money in relationship. Dragon is represented by Earth and containing water. Therefore, it brought more income for him during that period. There was sign of love blosom and it could meant meeting a woman in his life. From age 39 to 48, there is metal which represents having a good reputation in his life. Having metal helps him to become famous. And together with the Wood element, it will be an enhancement to his career path. In the year of the Rabbit, it created an opportunity of boosting his career further. From age 49 to 58, again the metal element maintain his good reputation and bringing him to become more famous than ever. There seems to be a slight problem with his family or marriage issue. Therefore based on the 10 luck pillars, Barack Obama is likely to be the next US President with marginal win for this election.